I hope you guys are enjoying the So-Shaadi series, and I am so happy to see that So-Shaadi series part 2 has been so well received. I have already mentioned a zillion times on my blog, that I am really thankful to my blog because it has helped me connect with like minded, intelligent and beautiful people, whom I would never think of connecting with in my wildest dreams. One such person is Sharvari Paivaidya Mehan. A few months ago, we came across each other's blog through Twitter. And have been following each other since then. I don't like her blog...I LOVE IT. And in case you haven't checked her blog yet, you should right now. You can thank me later. She blogs on Mumbai to Melbourne, and happens to be my newest buddy from the Blog World. With her impeccable style and culinary skills, she is sure to floor you away. I was humbled when she agreed to do this post for my blog. 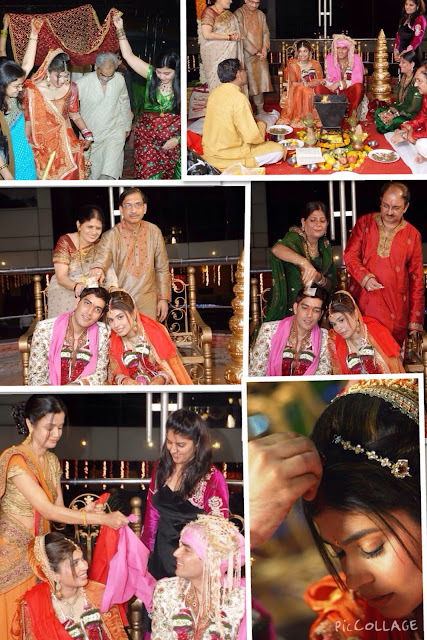 A Maharashtrian/ Konkani Bride with a Punjabi Groom - loads of happy relatives and friends and a big fat Punjabi wedding with a combination of pre wedding ceremonies encapsulates our wedding story! Since we both lived and worked in Melbourne we had to oversee our wedding preparations from Melbourne. Not an easy task! About a year before the wedding day our parents officially met and it took a while for us and them to come to a consensus on the wedding date! After much deliberation with the Panditji and us it was then decided that 11th of Dec 2010 was going to be the D'Day ! 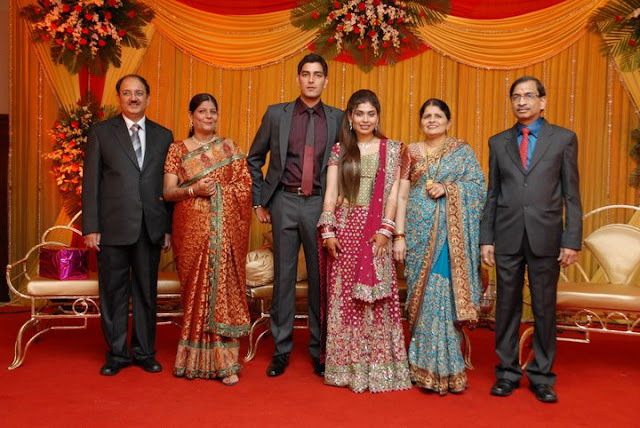 We gave our Parents a brief on the wedding venue options based on our research and after about 2 weeks of going off the list and other options suggested by family and friends they zeroed on Kohinoor Hotel as our wedding and reception venue. It was my Mum in law's idea to have the pheras( wedding ceremony ) near the poolside so that the calm cool blue water would add to the backdrop for the wedding ! Next came the food tasting and menu selection which our parents had to head to as we were in Melbourne however we advised them on the menu items we wanted and ones we didn't ! After a couple of tasting sessions both families and we came to a conclusion! The venue and menu were booked and suddenly I had the feeling of OMG I am getting married!! A few months before the SHAADI the wedding cards were designed and mailed to family close and distant and friends and relatives. One of the most important aspects for any bride is what she wears .I love to research and read and planning my wedding trousseau was no different. I got my cousin sister, maushis and Mom to help find me a boutique with a tailor I could trust. I selected colours and styles of sarees and other Indian wear I wanted and emailed them to my family. They went and hunted for similar options. This is how I managed to decide and plan some pre wedding outfits. 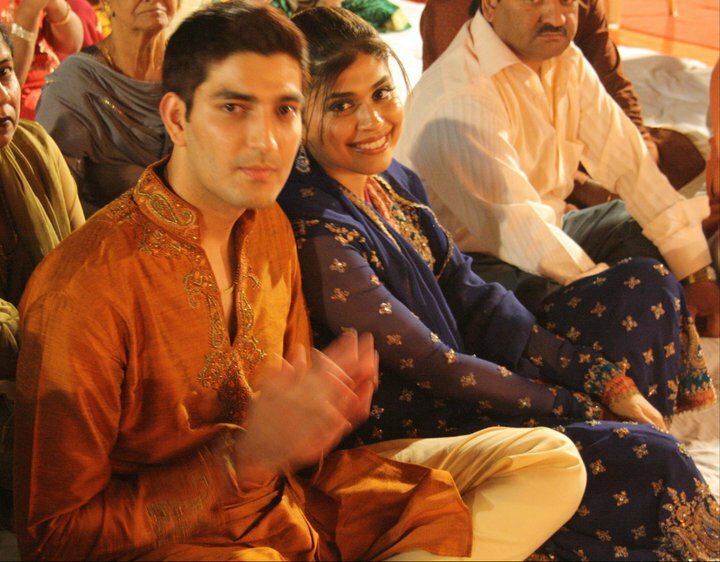 My wedding outfit was a vintage Ghagra that was my sisters which she wore just once. I got it reworked and embroidered and I custom designed my own choli blouse and got the boutique to help procure 7 different fabrics which after my approval was then stitched together into a blouse.I was truly a new age bride with technology being my best friend. What would have I done without gmail, skype and g’chat!!! I could only get a month off as Annual leave. I landed 15 days before my wedding and the wedding madness started with shopping for other wedding outfits which are part of SHAGUN that is received from the husband's family! By Day 2 I was done with the rest of the outfit and jewellery shopping! Next came the skin and hair style appointments to decide on the look for each of the wedding ceremonies! By day 3 I was absolutely ready to take on the wedding ceremonies head on! Two days after Mata kiChowki we had a small intimate haldi ceremony at home only with my immediate family. My cousin sister, maushis, mum and grandmum applied haldi from my forehead, to the feet about 7 times. The belief is that haldi brings out the bridal glow and since haldi has natural medicinal and calming properties it is applied to calm the bridal nerves. Post that session in the afternoon we had the shagun ka mehendi that was received from the husband’s side. This used to be an old custom where the brides palms were adormed with only this mehendi. However today it is more of a shagun (good luck element) which is applied on the finger tips. I had a Mehendi artist to complete a simple mehendi on my hands and feet. I did not want something too intricate as I lack the patience and cannot sit at the one place for too long. The mehendi brings in luck and is part of Shringar for the bride ! The myth is the deeper the colour of the mehendi the deeper is your husband's love towards you!! The whole apartment by now was adorned with flower Torans and lights! 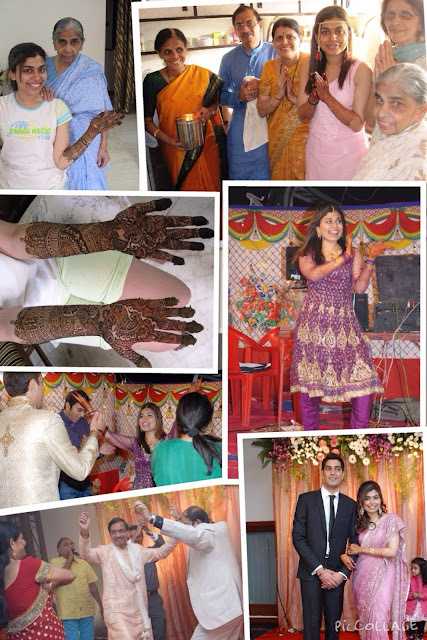 The same evening was the SANGEET AND MEHENDI function that was organised by the Bridal party! We organised it on the terrace of our apartment complex. The Groom and his family and friends were also invited to this gathering. 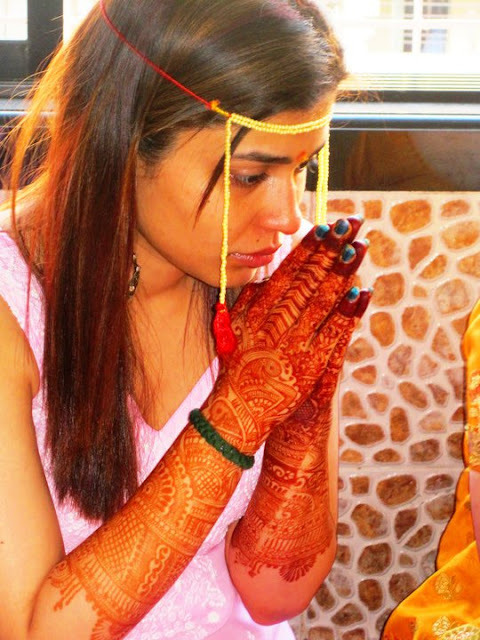 There was a Mehendi and Bangle Corner where all women adorned their palms with henna! Then was the fun part the music and dancing! We had a mini skit enacted by my husband’s friend with my aunt which was based on Sholay’s infamous scene where Amitabh tries to marry off Dharmendra! The dance performances by my parents brought tears to my eyes! The fun part was my own performance on a medley of songs!! This was followed by dinner that the bridal side catered to from New Yorker(Juhu). Our menu was a mix of Italian pasta and pizza along with assorted salads and fresh juices. There was also New Yorkers infamous Chooley Bhature and my most favourite dessert – the sizzling brownie !! Dinner was followed by games and then the DJ belted out the hits of the year and everyone was pulled to the dance floor. This was a fun evening as well as a chance to relax and unwind before the wedding. SHAGUN,TIKKA,ROKA, ENGAGEMENT AND COCKTAIL PARTYFollowing the MEHENDI and SANGEET were all the traditional Punjabi pre-wedding ceremonies followed by the COCKTAIL PARTY. We had to club these together as time was of essence. By now most of our relatives and friends from interstate and different countries had all arrived and it felt great to have everyone present on this day. I was escorted by the Grooms party to a separate room (bride is not supposed to see the Tikka ceremony) and the rest of my family headed to the venue room with 30 kg of mithai(sweets) and big basket of fruits and another basket with dry fruits as part of the SHAGUN Ceremony. They were received by the grooms’ family with Dholi’s playing live Dhol. Then began the TIKKA ceremony where all the bride’s family members apply tilak on the groom’s forehead and give him gifts in cash and kind. 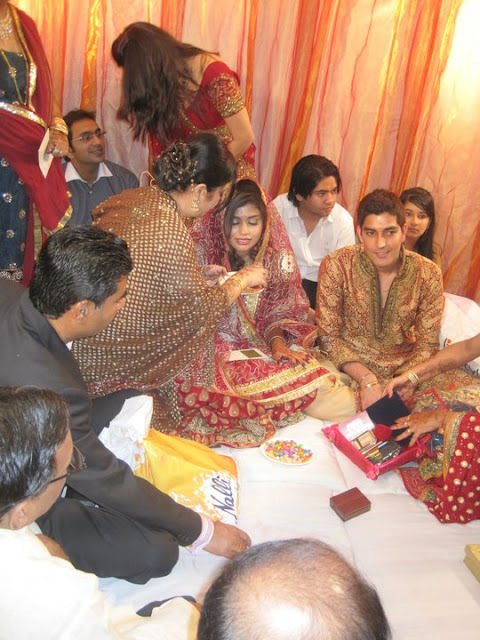 This is followed by the groom’s side of the family that then apply Tilak and give the groom gifts in cash and kind. Then I made a grand entrance and I was made to sit next to the groom. This was followed by the ROKA Ceremony. My parents in law made me wear a Red and gold chunri on my head and then I was given Shagun which included sarees, the outfit for Bidaai ceremony, jewellery and cosmetics for Bridal Shringar. Then the other family members from the groom’s family also gifted me with jewellery and cash. This is an official acceptance of the union of two families. This concluded by the exchange of rings which was our official ENGAGEMENT ceremony. The guests were now served juices, soft drinks and finger food and we got a chance to meet all our family members and friends. The DJ played music to keep the guests entertained. After the mandatory photo ops the bride and groom headed to get changed. I decided to wear a Georgette saree with a cocktail style blouse (self-designed)for the occasion. My inspiration for this outfit was designer Manish Malhotra and his designs. 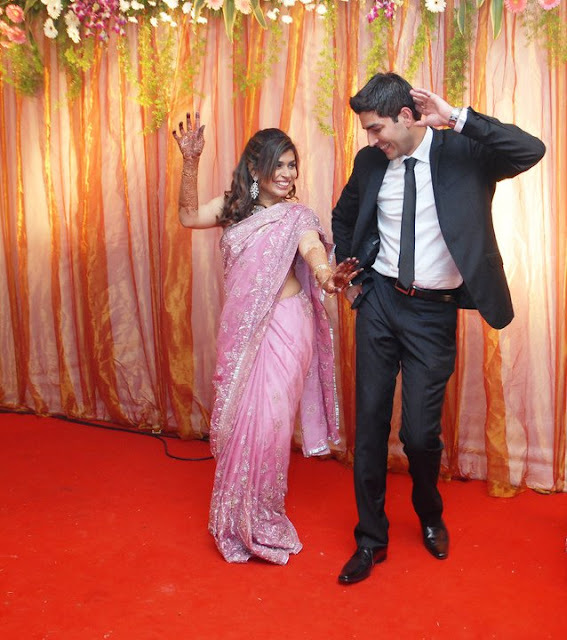 Ankit decided to wear a well fitted black suit to complement my outfit. We both made a grand entrance and then the Bar was officially opened. Drinks were served to all the guests and there were dance performances followed by Dinner. The party went on till early hours of the morning. 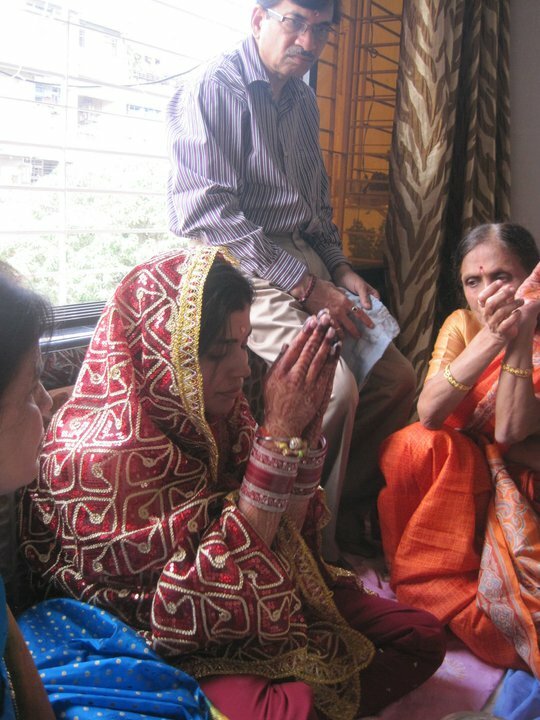 The next morning my sister in law and her husband came over and handed the CHUDA to my parents. They also handed me some Shagun with that which would be part of my Shringar for the SHADI. This was followed by the panditji that created a hawan and my Mama(Mom's brother) and my Maushi(Mom's sister) bathed the chuda (the red and ivory coloured bangles) with milk and then made me wear them on each hand. I had to keep my eyes closed as the Bride should not see the chudas until she gets ready in her wedding outfit. Later they tied a scarf over the chudas. This was followed by Maharashtrian rituals of Shagun by the bride’s extended family and friends with cash and kind. A couple of hours after lunch I had the hair and makeup person arrive to help me get ready. A few hours later I was ready to head to the Venue. While the MILNI was going on, I was escorted by my Maama and my cousin sisters and best friends under a Veil/ Chunri to the Pandal/ Stage. These were those few moments in my life where my heart was racing and I was nervous. The groom followed to the stage and we exchanged Garlands. This is the VARMALA ceremony. Later we sat on the stage and the Panditji started the wedding mantras. A Hawan Kund was lit with sacred fire. There are many rituals and Mantras that are chanted by the Panditji during the wedding. This is followed by 7 PHERE Ceremony where the bride and the groom take 7 rounds around the fire and make 7 promises to love, protect and forever stay together in sickness and good health. The husband then fills a pinch of Vermillion on the bride's forehead. 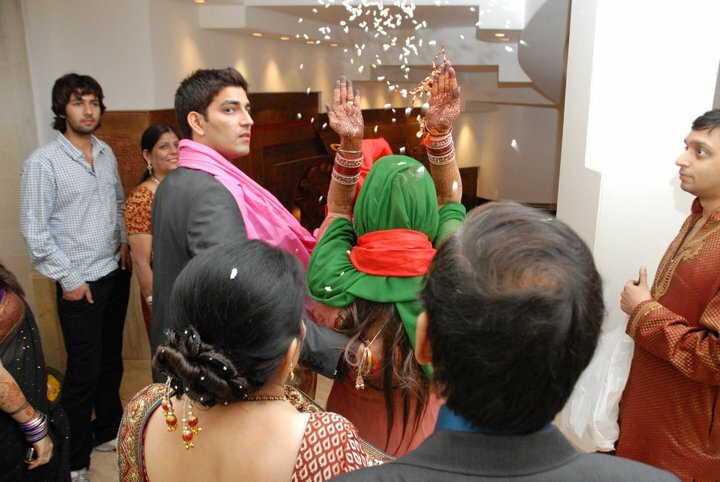 This is the Sindoor Ceremony which states that the girl is now officially married. This is followed by tying a Mangalsutra /sacred gold and black beaded thread around the bride’s neck as a significance of undying love and protection. 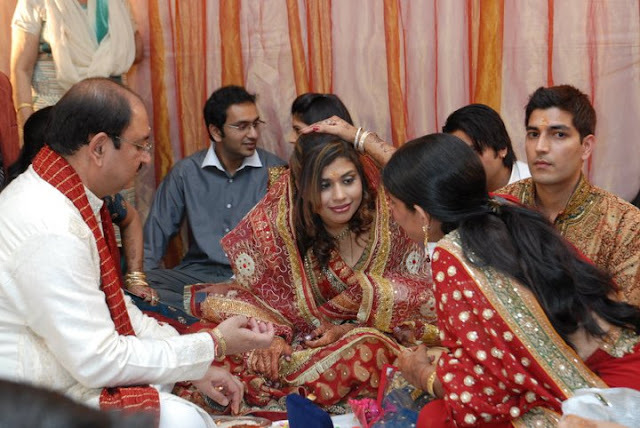 This is the MANGALSUTRA Ceremony. This completes the SHAADI Ceremony. Post these both of us took blessings of our Grandparents and Parents and all the Elders of the family. After the Photo Ops we headed to get changed for the RECEPTION ceremony. Our Reception was indoors and by the time we made an entrance as Newlyweds all our guests had arrived. We greeted everyone and by the end of the evening I could feel my cheek muscles were getting toned thanks to all the smiling. It was lovely to see my College teachers who also came in to bless me. I had a lovely time with our friends and family especially those who flew in from interstate and flew in from Australia just to be with us. We were so happy that everyone seemed to have truly enjoyed our wedding including us. Dinner was served followed by lots of Photo sessions with family. It was nearly 1 am and time to change into the BIDAAI Outfit given to me by my in laws. I was made to wear a Green Dupatta on my head that was a ritual to then send this dupatta to the Kuldevi temple in Chandigardh. I was very emotional at this point. I had to walk with my husband and could not look back. While walking I had to throw puffed rice and my Mum had to catch it in her dupatta. This signifies throwing all the luck back to my Parents as I was leaving the house to my new abode. After reaching the gate I could not hold back my tears anymore and being the youngest in the family neither could any of the elders. They wished me luck as I sat into the car to travel to my new home. 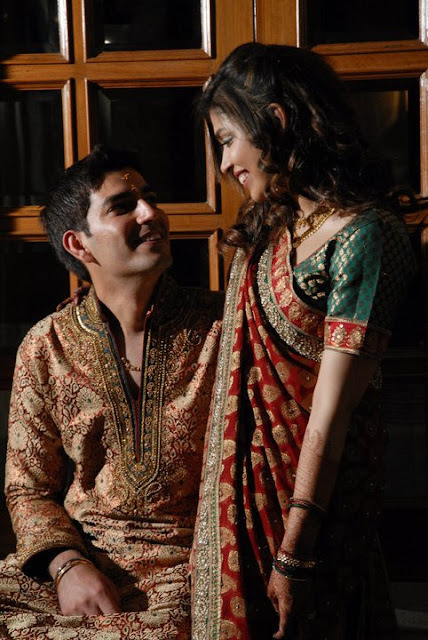 I thank Aditi for inviting me to write this guest post as it revived all my Shaadi moments. It has been nearly 4.5 years to the wedding and 11 years of togetherness for my husband and me. I cannot thank God enough for all the love and blessings he has showered upon us. I am truly blessed to have both families that are understanding, loving and totally supportive. 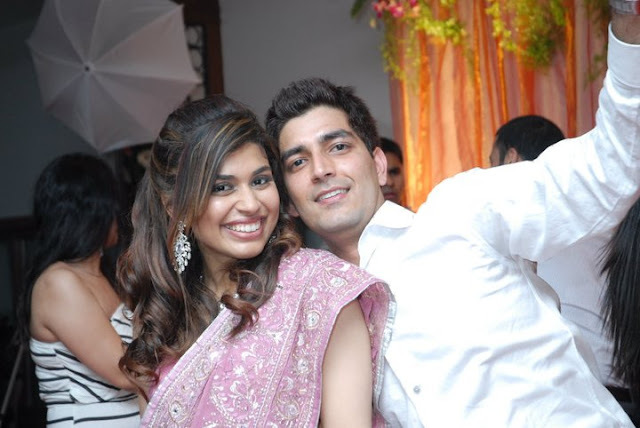 So if you are planning a BIG FAT PUNJABI WEDDING you know what to do... Bookmark this post !! I love Sharvari's blog too! She looks so beautiful on her wedding day and looks like she had a lot of fun too! Fantastic post! Thanks for sharing about Punjabi weddings! I love Punjabi weddings 'coz they have so much dancing going on everytime. It's soo much fun and is all the highlight of a Punjabi wedding. Such an interesting post! Loved it.